My Emmental cheese recipe will give you all the resources you need to make a wonderfully tasting and visually exciting cheese at home. Say hello to large cheese holes! You will have the satisfaction of being able to produce one of the most challenging cheeses in the world in the comfort of your own home, with a proven recipe that has worked time and time again. Find out what the difference between Emmental, Emmenthaler and Swiss Cheeses is. Emmental cheese, also known as Emmenthaler cheese, is a type of hard, pale yellow cheese that is produced in huge wheels, often weighing hundreds of pounds. The cheese originates from the Emmental region of Bern, Switzerland. 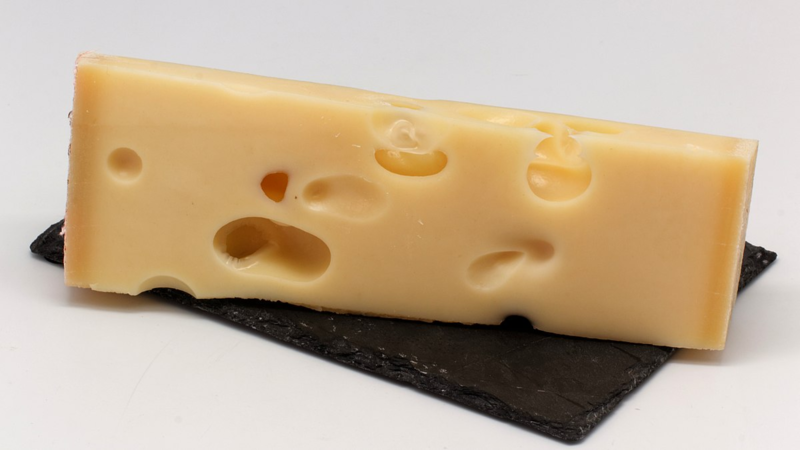 The Swiss cheese has holes that look like ‘eyes’. It’s roots began in the Swiss region of Val d’Emme. 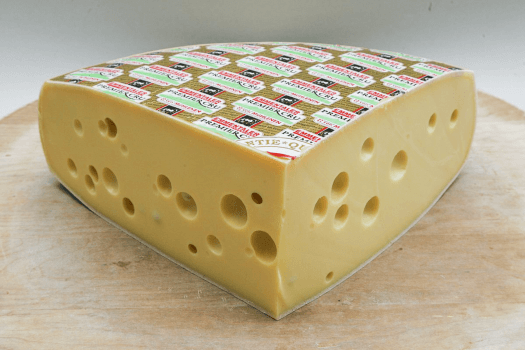 Perhaps the biggest defining factor about Emmenthaler cheese is that it can be linked directly to the town of Emmentaler, Switzerland, specifically in the Emme valley in the Canton of Bern. The making of this cheese dates back to ancient times when farmers would milk their cows twice a day and collect the milk in giant vessels. The cheese is produced in a typical round shape with a natural rind and is aged in traditional cellars for a minimum of four months. Emmental, Emmentaler, and Emmenthaler cheeses are all the same cheese and are Swiss cheeses. Swiss cheese, on the other hand, is NOT an Emmental cheese. It gets confusing. Traditionally made using unpasteurized cow’s milk. The cheese has a small rind that is covered with a paper showing the cheese’s origin and producer. It melts easily, and is why it is more often used in sauces, it also goes well with fruits. It’s taste has been described as being slightly buttery, mildly shape and even a bit nutty and fruity. Originally from Switzerland, this type of cheese is also produced in other parts of Europe such as Bavaria and France, and is made using pasteurized cow’s milk. Similar to Emmental, Swiss cheese melts easily but is used more often in sandwiches than sauces. There are two other types of Swiss cheese; American Swiss, and Gruyere cheese. The taste can be described as having more of a nutty flavor and is made in such a way that it doesn’t have a rind. A common question I’ve heard one too many times before is, why does cheese have holes in it? The bacteria used releases carbon dioxide when it consumes the lactic acid in the cow’s milk. The carbon dioxide forms bubbles which don’t just disappear but instead form air pockets which result in the characteristic holes of this Swiss cheese. Cheesemakers use three types of bacteria during the production. These are Lactobacillus helveticus, Streptococcus thermophilus, and Propionibacterium freudenreichii. 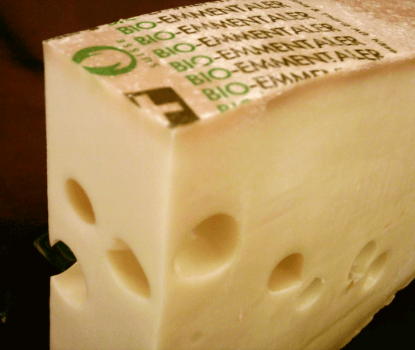 Swiss Emmental AOP certification demands that No preservatives or ingredients from genetically modified organisms are used in the making of this type of cheese. Classic: Aged for four months. Reserve: Aged for eight months. Premier Cru: Aged for 14 months. This type of Swiss cheese with holes has gone on to win numerous international awards and nominations. The cheese has a thin rind that is typically covered with paper bearing the producer’s name on. The cheese has a sweet aroma with tones of fresh-cut hay, a very fruity flavor that is not without a tone of acidity. Emmental has distinct walnut-sized holes and is considered to be one of the most difficult cheeses to make. You can store you cut cheese in the refrigerator for 3 to 4 weeks. You, however, do need to wrap it properly by inserting parchment paper in-between the slices and afterwards wrap the entire package loosely in plastic wrap. When storing cheese it is advisable to look out for any signs of mould growth as you might need to discard all of the slices with the mould. Storing Emmental cheese in your refrigerator should prolong its life by up to three weeks. Putting it in the freezer further extends it’s life to three months. However, frozen cheese has been known to become crumbly and lose some flavor. There are so many recipes you can try. My absolute favorite, however, has to be fondue. Throw in some Emmental cheese, gruyere, lemons and some white wine and I assure you your taste buds will be screaming for more. Potato fritters; another of my favorite recipes. Crispy baked chicken breasts with Emmental cheese and grilled vegetables. Meatloaf with tomato soup and Emmental cheese; a classic holiday meal in my home. In case you might be wondering what wine to pair this flavorful cheese with, here are some suggestions. If you are having a fondue pot with Emmental cheese and gruyere, you might want to try some Chardonnay. Basically, fruity reds, medium-bodied whites, vintage sparkling wine, and aperitif wines pair well with Emmenthaler cheese. A great wine to try with emmental cheese is Jura Blanc. This recipe is from the Making Artisan Cheese Book By Tim Smith and is a recipe best doubled to get bigger eyes in the final cheese. I have used this recipe multiple times to produce great homemade cheese (even though sometimes the holes in the cheese didn’t quite turn out). 8 litres or 2 gallons of whole cows’ milk. A quarter teaspoon of direct set thermophilic culture. One teaspoon of propionic shermanii powder dissolved in a quarter cup of warm milk. Half a teaspoon of liquid Rennet diluted in a quarter cup of boiled and cooled water. Non-iodized cheese salt for the brine. Warm the two gallons of cow’s milk to 33º Celsius or 90º Fahrenheit. Add the cultures and stir thoroughly. Cover and leave it to ripen for about 10 minutes at 33º Celsius or 90º Fahrenheit. Add the diluted Rennet and stir for a minute. Leave it to set for about 45 minutes or until you have a clean break. Carefully cut the curd into a quarter inch or 6mm cubes. Keeping the curds at 33º Celsius or 90F, stir the curd for 40 minutes using a whisk to cut the curds into a uniform shape and size. Slowly raise the temperature to 49ºC/120F over a period of approximately 35 minutes. Stir the curd frequently to prevent it from matting. Once the curd temperature reaches 49ºC/120F, maintain the temperature for 35 more minutes while stirring with the whisk to cut your curd to even smaller sizes. After 35 minutes, pause stirring and let the curds rest for 5 minutes. Pour the curds into a 900 gram or 2 pound-mold lined with a cheesecloth. Press at 10 pounds for 15 minutes. (To know your applying the right PSI, calculate your cheese pressure here). Remove from the mold, unwrap, flip and redress the cheese. Press at 15 pounds for about 2 hours. Press at 15 pounds for 12 hours. Remove from the mold and unwrap the cheese. Soak in the brine solution for a total of 12 hours, flipping the cheese every 2-3 hours. Remove the cheese from the brine and pat dry. Once the cheese begins to swell and rounds at the edges, return the cheese to the refrigerator at 7ºC/45F and 80 to 85% humidity for 3 months. Turn and wipe down the cheese three times a week. 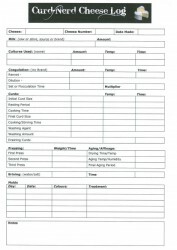 Do you have any questions or comments? Join the discussion over at the Curd Nerd Forum. We would love to hear from you and to see photos of your cheese! I hope you enjoy our Emmental cheese recipe.